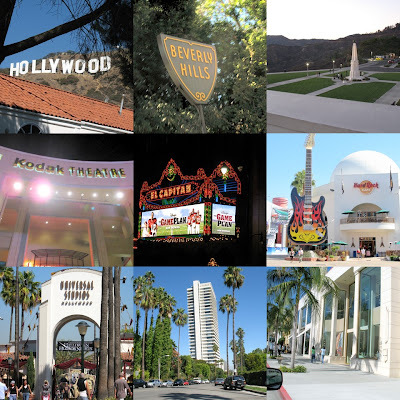 In one day, we did all there is to see in LA (at least the touristy spots) - Hollywood hills, Rodeo Drive, Griffith Observatory, Melrose Drive, Walk of Fame, Kodak Theater, Universal Studios Citywalk, drive through downtown at Staples Center, we even ate at Pink's Famous Hotdogs! We purposely did not go to any theme parks as we were not with the Little Bee - we are saving it for next time. The next day, we did some serious shopping at the outlet shops and spent time with the kids. 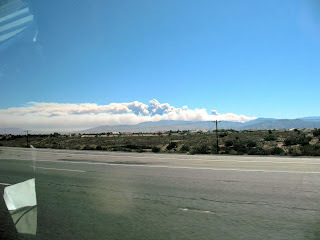 And then my bro took us to Orange County, along the Pacific Coast. 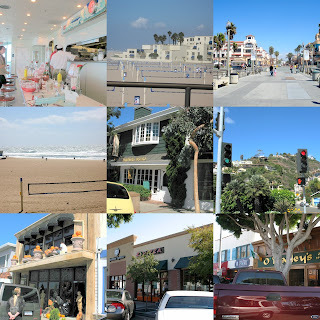 It was wonderful to see Seal Beach, Sunset Beach, Huntington Beach (where we had a delicious strawberry-banana milkshake at Ruby's Diner), Newport Beach (yes, as in the OC! ), and finally to my bro's place of work at the Laguna Beach. 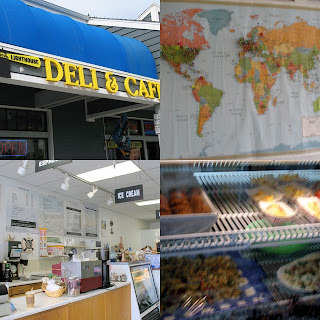 The quaint little shops here are something to explore next time around. It was nice to see my brother and his family, I never knew I missed them until I saw them again after an awful lot of time. Our vacation ends in LA, where we took a flight home. After a 9hour pleasant Amtrak ride, we arrive at about 10pm at the Penn Station (Madison Square) in the heart of Manhattan. Oh what a glorious feeling to finally be in the city I have always wanted to visit! Needless to say, we got out of the station into the street with me grinning from ear to ear. New York is what I expected and more. We spent 6 days in the city, yet felt like we just did a quarter of what we wanted to do and see, and I just cant wait for the next trip. As a first time tourist, our days were full with activities which unfortunately we had to line up for (so many tourists!) and that ate up most of our time leaving little to explore the city on our own. I wanted so much to see and savor everything - but I guess that's just New York for you - it will leave you hanging, wanting more. One visit is never enough. The Empire State Building was both mesmerizing and romantic. The whole city right before your very eyes, it was a feast to the senses. Go very early or late, otherwise you end up like us who had to spend an aweful lot of time in the line. The Statue of Liberty. The boat ride was more memorable to me than the island itself. One cannot go on top of the statue anymore as the stairs are brittle (and here I was thinking it was because of Sept11). Wall Street. 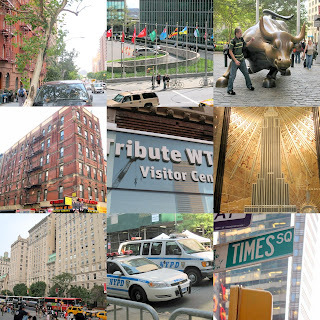 This little street is a huge part of our itinerary, as my work is very much fixated on what happens everyday in the very important building on that very street. Times Square. Indeed a sight especially at night. All the mesmerizing lights looking down at you. And the people, the people! So.many.of.them..
Broadway Show. We only had one chance yo watch so we chose a classic, The Phantom of the Opera. Omg I could weep - that's how good it was. Central Park. A pity we didnt get to go around much, but then again it covers 51 blocks! But I had a great time observing all the kids playing in the playground, people walking their dogs, nannies with kids in tow. Metropolitan Museum of Art. Huge imposing stairs and facade. We're not museum people though, so hardly anything to say here unfortunately. Rockefeller Center/St. Patrick's Cathedral. Very grand indeed. Madison Ave., 5th Ave. Oh the sights in these streets! Residences with doormans, shops and more shops! Ground Zero. Just looking at the site is not good enough, you have to enter the memorial museum across. It brought tears to our eyes, this is not to be missed. And after Ground Zero, console yourself with a HUGE shopping spree at Century21 just across. 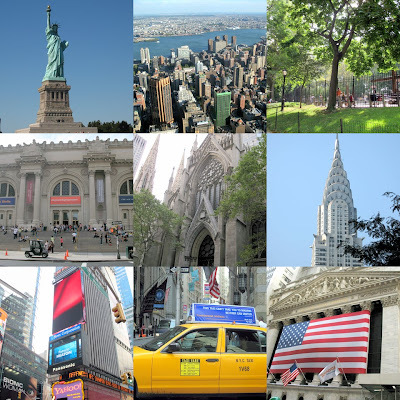 I believe now what the brochure says that it's New York's best kept secret! Oh wow, the bargains in the store are unbelievable. Hello, how come nobody warned me about this place? Never to be missed. Sugar Sweet Sunshine. Had a good chocolate cupcake in this place, my consolation for not having had a chance to go to Magnolia or Billy's. Roasting Plant. Now this is a very good discovery indeed. Walking around we discovered this little shop that sells probably the best cup of coffee we've ever had. They have a system and a huge contraption where your coffee beans fall from a huge storage (tubes and all) to the roasting station. It's roasted on the spot - the owner was there explaining to us that the idea is to roast the beans at the specific time and serve at certain temperature to create a perfect cup of coffee. Or something like that.. Argg, just go and find out for yourself! Economy Candy. Sugarland, candy in every nook and cranny of the store. I can imagine myself buying in bulk nuts and candies for a huge baking spree! Caffe Napoli in Little Italy. A nice Italian lunch after a spin around Chinatown. Because we were on a budget, wed almost always end up eating pizza. The best ones for us - Steve's Pizza near Ground Zero (110 Trinity Place) Wohoo, it certainly hit the right notes! Later on, on our very last day after visiting the UN, we chanced upon another good pizza find called the Ultimate In Pizza (401 E 57th cor. First Ave). Generous amounts of white cheese with spinach. Drooling now.. Shake Shack in Madison Square Park (not to be confused with Madison Square Garden, take it from me). Everything they say about how good the burger is - so true! We went towards closing time at 11pm which was just as well since I dont think I could have endured another line! Anyways, other than the burger - the most memorable perhaps is Abita rootbeer! So good! We're very happy we chanced upon this. Em has this habit of ordering drinks we do not have back home, and this is his most amazing find. 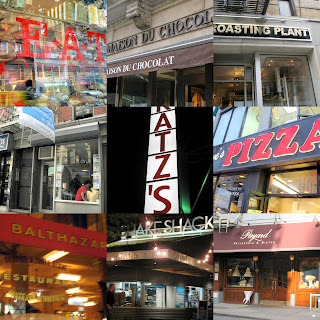 Eat by Eli Zabar. This place in the Upper East Side is just so amazingly filled with breads, cookies, cupcakes. 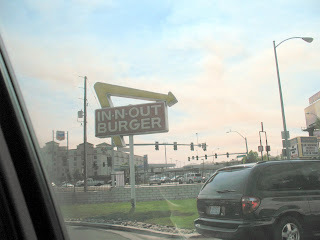 Im pretty sure I'll go fat if I have this in my neighborhood. Grand Central Terminal. 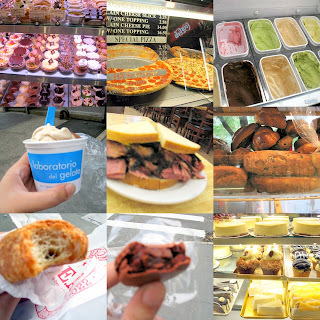 Lots of goodies in one strip of a food mecca. It reminded me of SF's Ferry Building Marketplace, but this is more packed. A stroll here is not to be missed too. Oh New York, when do I see you again? Heading East this time, we made a quick layover in Atlanta Georgia, before heading on to our next destination - Niagara Falls! 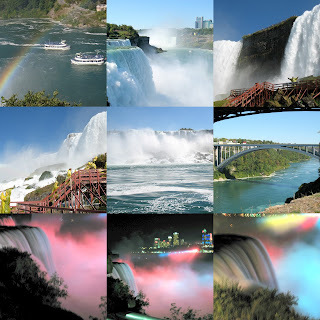 Landing in Buffalo, we took a 30 minute bus ride to the town of Niagara passing thru the city of Buffalo. Perhaps because it was a Sunday, I found Buffallo to be such a quiet city - I just cant beleive this is just a few hours away from NYC! We could see the Canada side just a few meters across, but we didnt have a visa and couldnt cross. The nightlife looks more vibrant in that side though, as the US side was kind of sleepy - but it was ok - we needed a respite before we head on New York City. 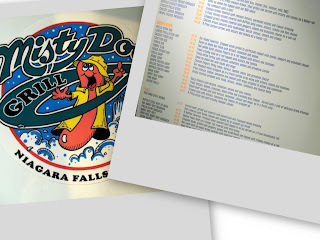 Roaming around looking for a decent dinner, we came upon two quite identical stand-alone food stalls right across the street from the main entrance to the Niagara Falls Park called the Misty Dog Grill and its ice-cream serving sister Twist of the Mist. We were taken aback by the huge gigantic menu, but as were were after all in Buffallo, why not try the Buffallo wings? It was the best choice as we would find out, hands-down the best buffalo wings Ive had! It has just the right hint of sweetness and spiciness, and was finger-licking good. I ate and licked every single piece, you couldnt see any hint of sauce when I was done with it :) Em's buffallo chicken sandwich was not bad too! Too bad we were leaving early the next day, and couldn't try the homemade ice cream just next door. Next time :) The next day, it was off to a 9-hour Amtrak ride to NYC! 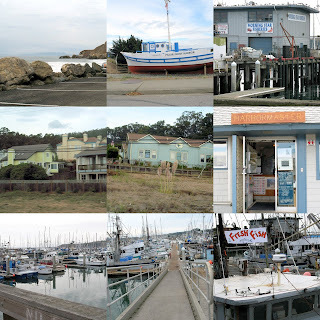 I can never leave California without making a quick post on Half Moon Bay, a delightful little town 30 miles south of San Francisco where we were taken by our hosts on our last day before flying east. 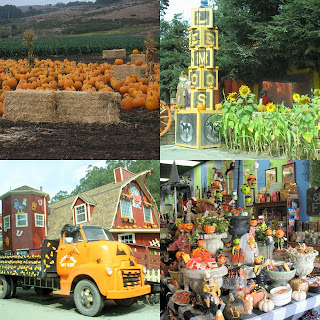 After a scenic drive along the Pacific Coast when we actually slept from the exhaustion of the night before, we passed some pumpkin patches, a first for me! Apparently a pumpkin festival is in the works for October. I would have loved to taste authentic pumpkin pies, but sadly we didnt have enough time to stop. 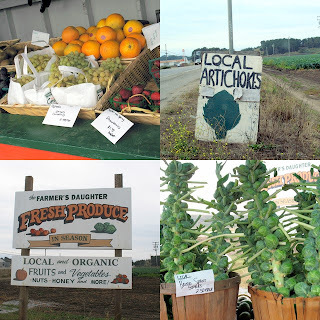 Do you see those brussel spouts at only $2.50 for the whole stalk?! Of all the places we visited, San Francisco is perhaps the place where it would be so ideal to settle if we ever do decide to go that road. I can't get over how pretty the whole city is, just driving around is just so appealingly pleasant. We were spoiled from Day1, as we were gifted with lots of different cheeses (aged cheddar, blue cheese, triple cream!) 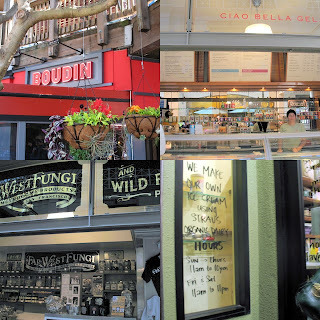 by Em's cousin who happens to be a cheese purveyor in SF.We would later on during the stay enjoy them in sandwiches with turkey breast, and as we would find out, San Francisco is a great city to have mini-picnics and our sandwiches came in just handy. 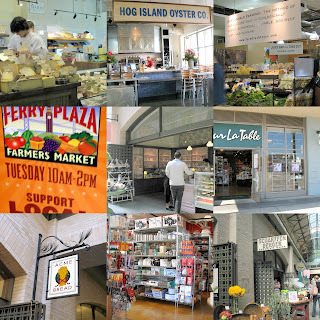 - the Ferry Building Marketplace, where I had my very first taste of figs! 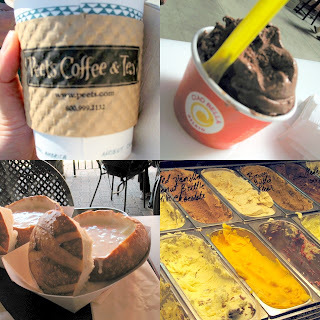 -Bi-Rite Creamery for luscious smooth ice cream. Worth a trip to 18th St, Mission District. The Bi-Rite Organic Grocery just across is also worth a visit. - Rainbow grocery, I just adore this one! Apple butter, real maple syrup, thick yoghurts, I go nuts with the selections here. Im still dreaming of this grocery to this day, how I wish we have this at home. - Other highlights are the touristy things: Alcatraz, Coit Tower, Twin Peaks, Palace of Fine Arts (wow! 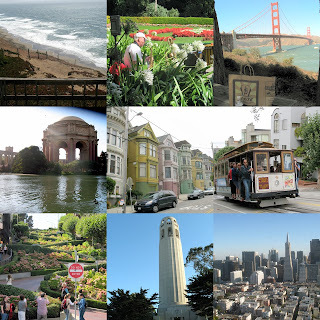 ), shopping at Union Square, visiting Castro district, driving by Noe Valley and Haight/Ashbury, driving down Lombard Street, walking the Golden Gate Bridge (yes, we did!). I love the laid-back feel of San Francisco, and the chilly weather is something I could get used to. I actually felt a pang of sadness saying goodbye to this city, even though I dont necessarily have family here. There's a certain charming eclecity tot he city that I never find anywhere else. We were walking in the Mission district late one night when we chanced upon this garage sign, and we laughed ourselves silly, Em and I. Such is the delight this city brings to us. Our vacation started with a smooth landing in Los Angeles, and what follows are memories both Em and I are still giddy about. Three weeks of walking, eating, sightseeing can leave one's pockets bleeding, but it was so worth it we are already planning next year's trip, with the Little Bee this time around. LA is great, but for now we are staying for just a night before heading to Las Vegas where our first meal was in In & Out Burger! It lived up to the hype, fresh beef that was never frozen and real potatoes cut in the premises. It's not hard to understand why there is always a line forming at the counter. We made sure we had our fix of In N Out as we were told we couldn't find it in the East - our next stop in the coming weeks. Las Vegas was great, brimming with lights and enthusiasm. We did all the touristy things, saw the hotel lobbies (Venetian voted as the favorite), watched the Bellagio fountain show many times over, did the slots, sunk in the view from the Eiffel Tower in Paris Hotel, even did a day tour to the Grand Canyon (which by the way was really GRAND) and of course, ate the buffets - the one we like best being the lunch buffet of Mandalay Bay. After a particularly long night however, we found the best food we had in Las Vegas - tucked away in the farthest end of the Strip is a diner called IHOP (International House of Pancakes, as we would later find out and listed at the NYSE, as I would find find out much later at home) where I was to have hands-down the best pancakes Ive ever tasted (sorry Pancake House!). It was the big floppy kind of pancakes, and I could imagine all the butter that went into it. Their tag line goes Come Hungry, Leave Happy. Indeed! 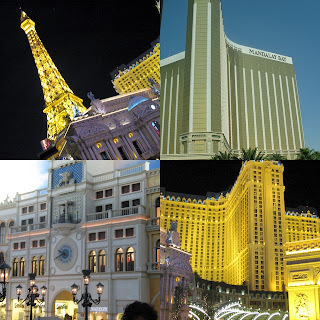 While we very much like Las Vegas, what was to come in our 3-week itinerary are even better. On to San Francisco next. PS. Thanks heaps to my bro and his wife for bringing us to LV, and thanks to my friend Banj too. 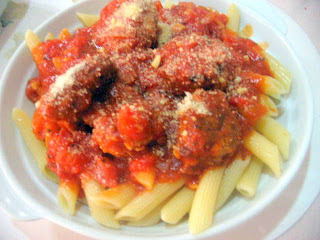 A few food reminds so much of comfort and home to most people than spaghetti. It is a kiddie party favorite, a comfort to eat when you just want to lounge around, a great comfortingly familiar dish to share with your girlfriends and a festive lunch to share on a Sunday with your family. From a simply bolognese, we slowly gravitated to large meatballs - which is great since as simple as it is to make, the herb(y) meatballs brings so much more sophistication into the dish!